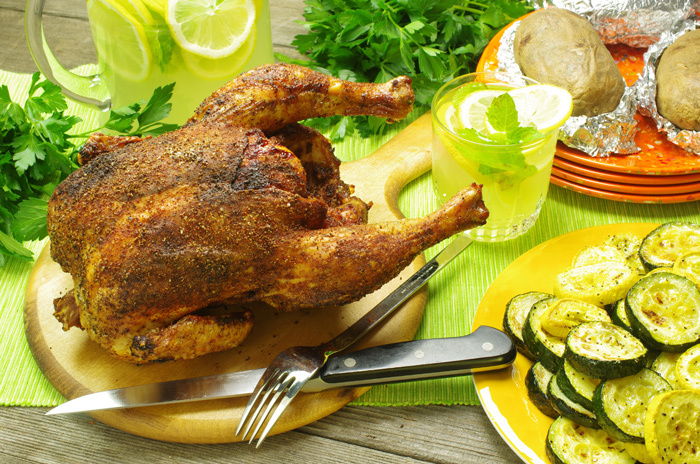 1 chicken, 3- to 4-lb. Prepare grill for indirect heat with drip pan, building a medium-low fire in a charcoal grill or heating a gas grill to medium. Add enough water to drip pan to reach a depth of 1/2 inch. 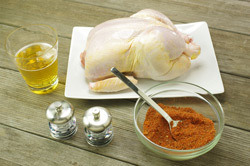 Apply your favorite spice rub, if desired, under and on the skin of the chicken. Season with salt and pepper. 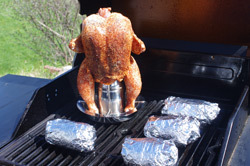 Place the chicken on an open beer can so that the can is inside the cavity. Place upright on grill. Grill, covered, over drip pan until an instant-read thermometer inserted into the thickest part of the thigh registers 165°F, 45 minutes to 1 hour (add more charcoal to charcoal grill as needed during cooking time). 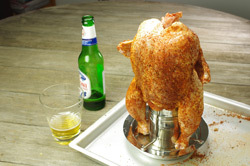 Want another reason to love Beer-Can Chicken? It’s endlessly adaptable. Instead of beer in a can, you can use wine or water, enhanced with any herbs, spices, and flavorings you like. Once you’ve tried the basic recipe above, experiment with these internationally inspired riffs. 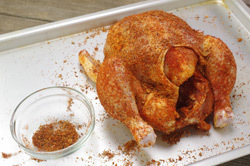 Rub a mixture of extra-virgin olive oil, minced garlic, and smoked paprika (use the Spanish version, Pimentón de La Vera), under the skin, in the chicken’s cavity, and all over the outside of the bird. Then tuck paper-thin slices of Spanish chorizo sausage under the skin. Add hot pepper sauce and a few rosemary and thyme sprigs to the half-full beer can. Then rub the bird all over with a blend of melted butter, Creole seasoning, minced garlic, and Worcestershire sauce (don’t forget the inside of the cavity). 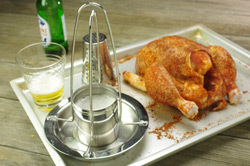 Make a mixture of toasted sesame oil, reduced-sodium soy sauce, honey, minced ginger, garlic, Chinese five-spice powder and crushed red pepper flakes; rub all over the chicken. Once the bird is done cooking, sprinkle with chopped scallions and cilantro. Serve with hoisin sauce. 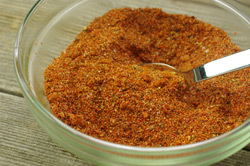 Make a big batch of this tasty all-purpose rub (it’ll keep for up to 3 months) and it will pay you back in smoky dividends all summer long. 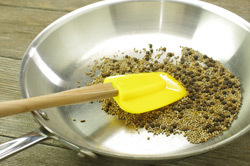 Stir peppercorns, mustard seeds, and cumin seeds in a small dry skillet over medium heat until toasted, about 2 minutes. Let cool. Put into a spice mill with remaining ingredients and pulse until finely ground. DO AHEAD: Store in an airtight container for up to 3 months. 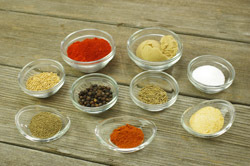 If you’re using bottled, ground spices, use the same measurements (but you won’t need to toast them in a pan).